Practical Bible Teaching: WHAT IS THE BEST FORMAT FOR A BIBLE? WHAT IS THE BEST FORMAT FOR A BIBLE? You’ve done your due diligence. You’ve researched pros and cons of the various translations until it seems you are overwhelmed. You’ve made it through all the belief systems (bs) of the people who do not know how to meet you where you are to help you, but only know how to tell you are wrong if you don’t do it their way. Even though you are not absolutely sure about your choice, you have settled on a translation—you hope. You begin shopping online, and once again, overwhelm seems the only option. On and on it goes, ad infinitum, ad nauseum. It’s not as bleak as it seems, though. There are steps you can take to whittle away at the mountainous task before you. Begin shopping online. When you find something you think you might like, write it down. If you are using Amazon.com, add it to your wish list for future reference. Otherwise, bookmark the page and save in a folder for further viewing. After you have mined your way through the multitude of options, visit a local bookstore and look at the ones you have liked. Check out the type for readability. Check out the other features to see if it is what you thought they were. Assuming you have settled on some sort of bible you can use for the study of God’s Word, what kind should you get? If you are new to the things of God, or have never really spent time studying the Bible, then I HIGHLY recommend the Thompson Chain Reference Bible. It comes in most all the translations popular today, so that shouldn’t pose too much of a problem. It is absolutely loaded with things that will enhance your understanding of God’s Word without telling you what to believe. 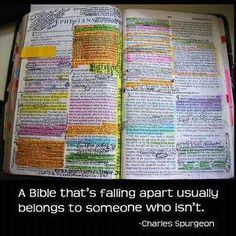 It also does not tell you what someone else believes as in most study bibles that have copious notes on each section of scripture. While it is not exhaustive in its references, it does give you many verses dealing with each topic it treats. Sometimes, finding the topic list next to a verse actually helps you to look at the verse in a different light. If you can only afford to have one book in your library for the study of the Bible, you can do no better than to have a Thompson Chain Reference Bible. There are also what is known as “study” bibles. Scofield held sway for decades, but is not nearly as popular as it once was, though many who were brought up on it still use it. While the English Standard Version Study Bible is gaining in popularity due to its thoroughness in many areas others have neglected, the New International Version Study Bible has been the study bible of choice for many for more than 20 years now. Next in line would be the Ryrie Study Bible, which also comes in various translations. Both the NIV and the Ryrie are bibles with notes added to the pages giving insight as to why something is translated a certain way, or what the meaning of the verse seems to be to the one who wrote the notes. Both are good, but becoming dependent upon the notes rather than your spending time in prayer concerning a passage, seems to me to be an inherent danger to this type of study bible. I’ve witnessed it too many times. The upshot of all this information? If you become a serious student of the Bible, then most likely, you will not be happy with only one edition anyway. You will end up with a collection of bibles for various purposes. If I can help you in any way with finding the right bible for you, please do not hesitate to contact me, either through this blog via a comment, or using the e-mail form at the top right hand on the side bar. You can also follow me on Facebook.